​OMG...this pic made my day...so awesome! Thanks for sharing this!! 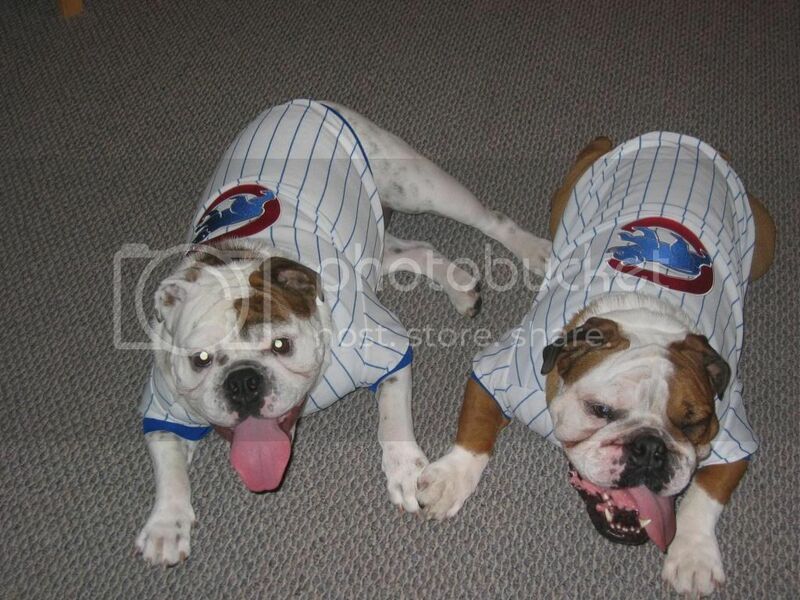 Im a big sports fan been to a few games in the US Berry is the proud owner of a Cubs collar. We share our stadium blankets tho we have a Cubs Bears and Penguins (all our teams) to keep us warm on a cold night. 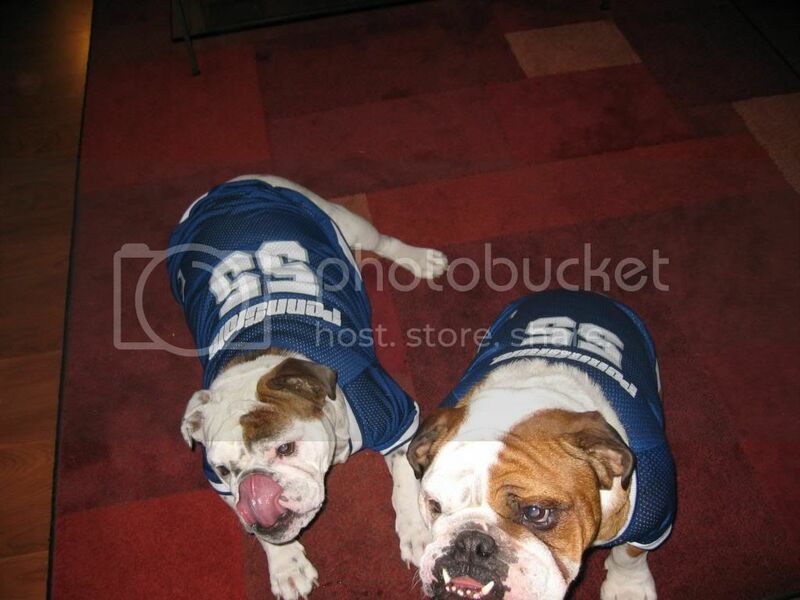 Wow Christine, That's an Awesome Twosome lol Love their Jerseys……. Thaks! Love my wrinkles butts! 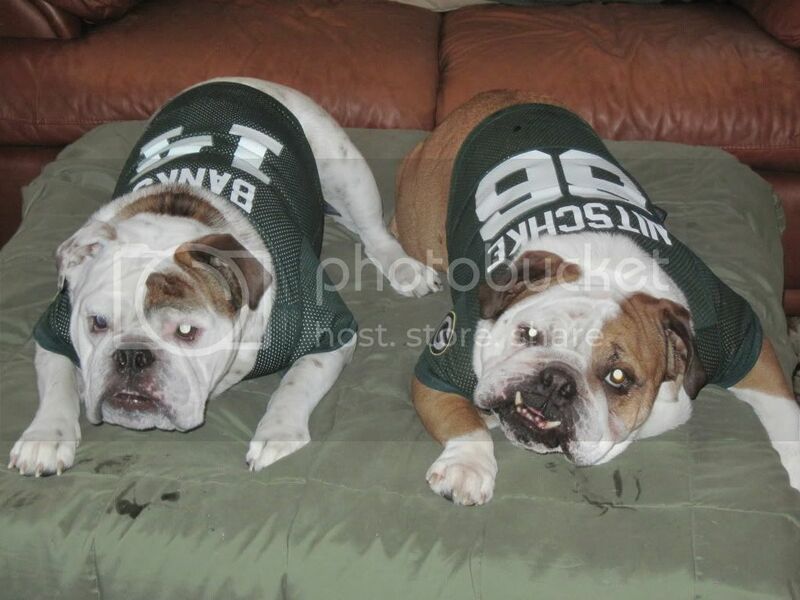 That picture was taken on Superbowl Sunday when the Packers won the first year with Rodgers at QB. 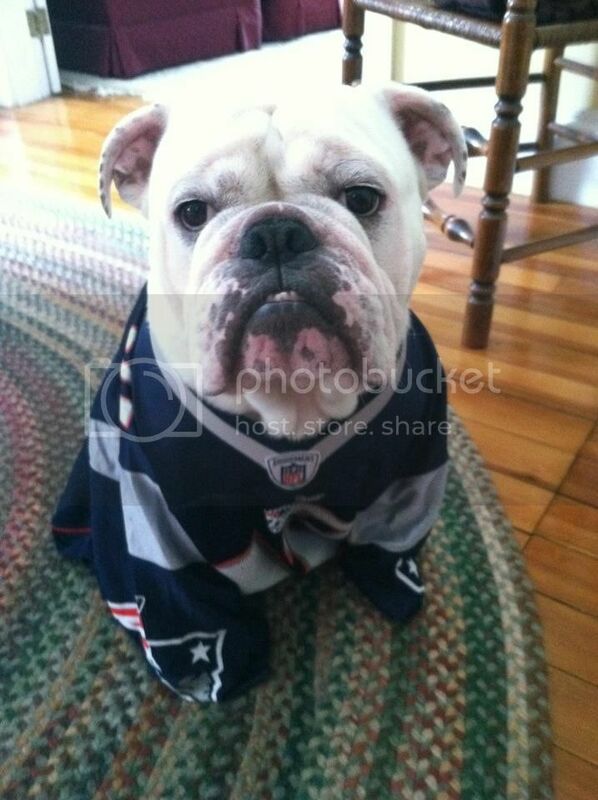 We had a big snow falling and when GB won -- my B/F and the pups were running in the snow all with jerseys on. It was too funny... did not last long enough for me to get a picture as he ran out.. in a couple circles and then right back in to watch the post-game. Christine I think Nitschke was a PRIME example of what a male Bulldog should and does look like. He looks so good in his jersey but his helmet pic is the greatest on earth! Buster want to look just like him when he grows up! I was really looking forward to this thread but once I opened it and saw the wretched Patriots jersey it kinda made me ill. I am ready for football was ready right after that Frisco flop. It is out there.... the kiddies also have Chicago Cubs and Penn State Jersey... I found Chicago Blackhawks and Flyers Jersey just have not bought them yet. I won't tell Gio that you were trash talking his favorite team! Well, dad's a die hard Cowboys fan, and mom says yuck. Poor Guinevere isn't sure which way to go for her team. Mom did buy her a cowboys tshirt when she got spayed just to keep her covered since we live in the desert, but she is too grown up now and it doesn't fit Mom's not really a football fan, but she sure doesn't like those silly cowboys with their silly stars on their shirts. I do have to admit Guinevere made the shirt look good! When I saw this thread I tried to get her to pose in a Bengal's tshirt. Grandpa Tom would be so proud! Since I'm from Cincinnati I wanted her to support my home team, I mean they need all the help they can get! And I thought her little tiger stripes are fitting She said my tshirt was too big and we don't dress her up, so she was really having a fit trying to figure out how to get out of the shirt (it's not because she is a cowboys fan ). So these are the best shots I could get before I relieved her of her suffering.